Look behind you, there might be something interesting happening. That’s one of the little lessons I’ve learned when out photographing. This is especially true if you are in a generally interesting location, in changing light and/or changing weather. Sure, that main subject you’re fussing over is important, but don’t forget to glance around every once in awhile. Even if you don’t come away with a stunning photograph of the whatever-it-is, you may still be glad you were able to see it. This happened to me while shooting the Bass Harbor Lighthouse written about in my last post. After the other observers left me alone on the rocky shore in the fading light, I looked behind me and there was the moon rising above the hill. When it is this high in the sky, the moon is notoriously difficult to shoot due to exposure issues, so the resulting photo is nothing spectacular for me. That doesn’t matter though, just the memory of that scene, at that spectacular location is all I need. Not so spectacular a photo, but a spectacular experience nontheless. One of the favorite places I have had the pleasure photographing is the Bass Harbor Lighthouse in Maine. Admittedly, it is one of the most photographed lighthouses on the planet – but as they say, it isn’t a cliche if you haven’t shot it yet. Lighthouses hold a particular appeal to me, probably because they are in short supply here in Kansas. In 2008 I was lucky enough to visit Acadia National Park and surrounding areas, including this lighthouse. There are two main places to shoot from, one on the west side looking back east (good for sunrise), and one to the east looking west (good for sunset). We were there for sunset on this occasion, so east it was. I’ve always been interested in astronomy as well as photography, but never really tried much astrophotography. The other night, when I found out Jupiter was making it’s closest approach to earth in decades, I went out to take a look. As is my custom when seeing something cool, I try and figure out if it can be photographed. I tried a few shots with my D700 & super sharp 24mm-70mm Nikkor lens. Although this lens gave very little magnification, when examining the images on the computer I was amazed that I could both see Jupiter was clearly a disk (not just a point of light), and a hint of what looked to be the four brightest moons. Now I’m fully aware that all this is visible in normal binoculars, but for some reason I had not expected it to be so obvious with my camera. Swapping out the nikkor with my Sigma 70mm-200mm I went back out. With this longer lens zoomed into 180mm or so you can actually see the four Galilean moons of Jupiter. (Ganymede, Callisto, Europa, and Io.) 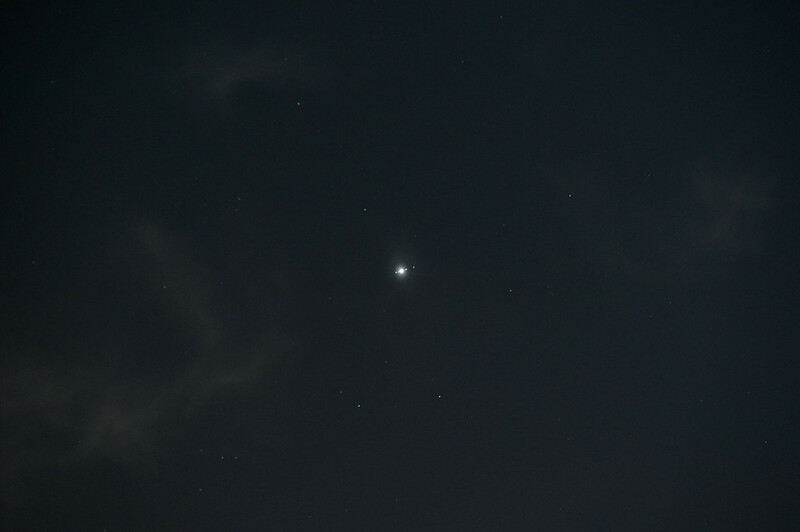 Yes, they’re just little dots of light, and Jupiter itself is way overexposed, but I thought it was really interesting that I could go out with just my camera and some normal-ish lenses, and capture this. I’m sure there are many thousands of astrophotographers out there to whom this is no big revelation, but I was impressed. I can see how this could be an interesting hobby. Jupiter at 180mm on a D700. Click for larger version.